Updated Taking self-portraits using a compact camera can be tricky: extending your arms far enough so that your nose doesn’t fill the shot, for example. But Samsung may have solved the problem by building a user-facing screen onto it two latest models. Samsung's second screen: perfect for posers? In addition to the ST500’s 3in rear-mounted screen and the ST550’s slightly larger, 3.5in main display, both models have a 1.5in LCD on the front which should help ensure self-portraits are always perfectly framed. Most compacts already have self-timers, but think of the advantages that a second screen will bring. For example, no running back to the sofa before the timer ends, no need to search for a suitable steady surface and the ability to snap perfectly framed, yet oddly angled, images. Rear screen sizes aside, both models are similar. 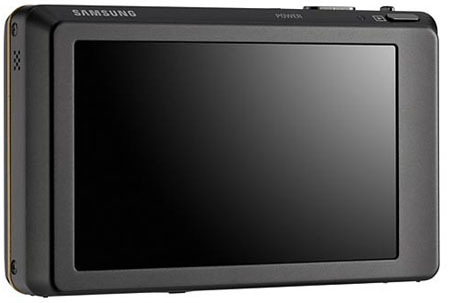 They incorporate a 12.2Mp CMOS sensor and support for video capture at up to 720p resolution. They have a 4.6x optical zoom and, according to some online reports, each also features haptic feedback, suggesting the rear screens are touch-sensitive, a fact confirmed by the lack of controls on the back of the camera. Launch dates and prices for the Samsung ST500 and ST550 haven’t yet been yet. 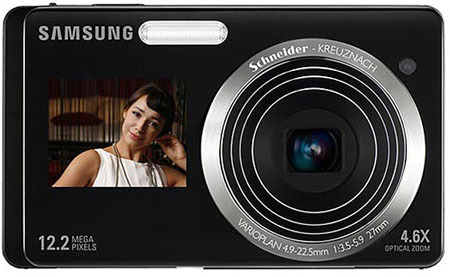 Samsung has since told us that both models also allow you to pin-point the camera’s focus by tapping a location on the LCD screen. A Smart Recognition feature even allows the camera to recognise up to 20 faces, with individual smiles and blinks also picked out.